Start off early from Kampala heading to Bwindi impenetrable national park. This is a long journey about 10 hrs-rides. We head south west of Kampala; stop in Masaka to see the equator and in Mbarara for lunch. Continue to Kisoro off to Bwindi. 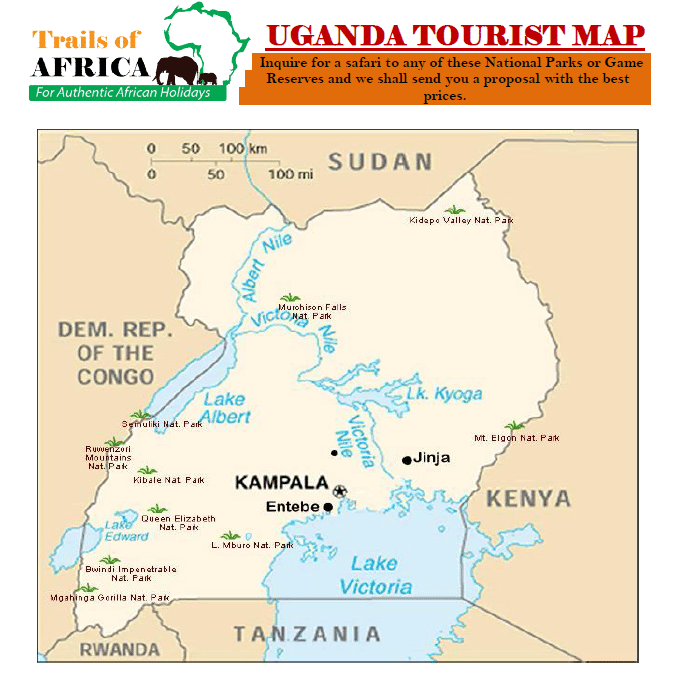 What makes this park a must visit is the endangered mountain gorillas. These are one of the top creatures that tourists demand to see. Overnight in Gorilla forest camp/ Buhoma Homestead. Get up early for breakfast and head to the park headquarters for briefing about the gorillas. Head for the thick jungles of Bwindi as you trek searching for the gorillas. This can take you half a day or more. Spend an hour with the gorillas. In the evening you can take a village walk around Buhoma and find out about the Batwa pygmy natives, also shop from available curio shops. Overnight in Gorilla Forest Camp/Buhoma Homestead. After breakfast this morning, transfer to Queen Elizabeth national Park (5 hrs) via the Ishasha route. On your way spot the tree-climbing lions alongside Uganda Kobs, buffalos. Finally when you enter the park begin with a game drive to Mweya Peninsular. Near the Mweya lodge there are buffalos, warthogs, Defassa waterbuck and bush baby among others. Visit the Katwe town. Here there are several saline crater lakes. Check out how the locals mine salt. Sleep overnight in Mweya Safari Lodge/ Mweya Institute. After breakfast go for an early game drive to Kasenyi plains where you will spot black and white colobus, bush buck, Uganda Kob, topi, Defassa waterbuck, and Cape buffaloes. A collection of birds like Cassin’s grey flycatcher, broad billed roller, black bee-eater along the banks of Lake Edward. This can take you 2-3 hrs. Head back to lodge for lunch then in the evening go for a launch cruise on Kazinga channel (2hrs) along lake George-lake Edward, come eye-eye with yawning hippos, crocodiles, leopards though sporadic. Watch birds for birders with over 550 resident species like flamingos, red chest, papyrus Gonolek, pink backed pelicans, malachite kingfishers, yellow crown, pink backed pelicans, water thick-knee, yellow billed stork, shoebill stock. Don’t forget your camera. Return to Mweya Safari Lodge/ Institute of Ecology/Simba Safari. This morning take your breakfast then head straight for chimpanzee trekking in Kyambura Gorge at exactly 8:00am. Did you know we have a lot in common? So spend some time with them to learn more. There are more diverse primates also mainly Black and white Colobus monkeys and other animals like antelopes, hyenas in the middle of savanna grassland. This gorge has many bird species. After here transfer to Kibale national park which is just a 4 hrs ride. Check in Primates Lodge/ Crater Valley Resort. Wake early to track chimps near Kanyanchu. This can take you half a day. There are primates in the vicinity like the golden monkey, L’Hoest monkey, grey checked mangabey, red colobus, blues and pottos. Other animals involve forest elephants unique from the common type, giant forest hogs and an impressive tree species. Later take a nature guided walk to Bigodi swamp sanctuary, a good site for birders. The Great Blue Turaco can easily be spotted among the other bird 137 species. There is also a variety of butterfly species. Return to Primates Lodge/ Chimpanzee Nest afterwards. You need to wake up and freshen up for a long journey to Murchison Falls national park. (9 hrs) on way look out for the beautiful views of Lake Albert, and Rwenzori mountains. When you reach drive straight away to the Top of the falls, quite a sight to appreciate the beauty of the River Nile and the falls. There’s accommodation at Sambiya Lodge/ Red Chili camp/ Nile Safari camp. Early morning go for a game drive in the Northern Nile delta circuit, quite a sight for checking out a high awareness of wildlife. You will spot the leopards along the leopard track, the Jackson’s hartebeest, large concentrations of Uganda Kobs because of the many breeding grounds and large families of the Defassa waterbuck, together with giraffe herds, groups of the dainty oribi and buffalo herds. The high supply of Kobs called for an unavoidable prides of lions to the delta too. The delta also attracts birders with specials like the Abyssinian ground hornbill, shoebill (herons, waders and egrets around small pools of water) Senegal thickknee and Denham’s bustard. What’s not there? In the evening head out for a launch trip on the famous Nile River and value God’s creation of the Murchison Falls, the largest crocs, Hippos and elephants playing in the water. After such a lovely encounter retire to your lodge at Sambiya Lodge/ Red Chili camp/ Nile Safari camp. After having a good breakfast, let’s head for a little close tour with our next of kin in the animal kingdom- the chimpanzees in Budongo forest. The forest harbors the biggest chimp population in Uganda -800 of them! So much we have in common with these creatures. Also you get to see other allied relatives like the black and white colobus, vervet monkey, potto and blue monkey. After wards take your lunch and drive straight to Kampala. This marks the end of this tour.